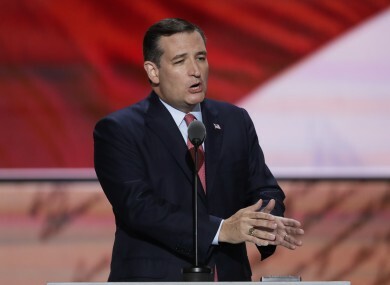 ONETIME PRESIDENTIAL CHALLENGER Ted Cruz shocked the Republican convention yesterday by thumbing his nose at Donald Trump and urging Americans to “vote their conscience”, sending the 2016 nominee’s bid to unify the party careening off course. Cruz received a standing ovation as he took the stage, but cheers turned to boos when it became clear the US senator from Texas did not come to Cleveland to endorse his former rival. Trump himself tipped the drama needle into the red by striding into the arena shortly before Cruz finished speaking, giving a thumbs up to people in the arena and surveying the remarkable scene of delegates thrown into turmoil by the Texan’s remarks, and who hounded him off the stage. “We deserve leaders who stand for principle, who unite us all behind shared values, who cast aside anger for love,” said Cruz, effectively listing criticisms levelled at Trump. “If you love our country and love your children as much as I know that you do, stand and speak and vote your conscience,” he said as the crowd erupted into yells of anger and chants of “Trump! Trump!”. The two men fought a bitter and at times deeply personal primary campaign, in which Trump mocked Cruz’s wife and tarred his rival with a nasty nickname: “Lyin’ Ted”. Cruz dropped out of the race in early May, finishing second to Trump in the delegate count. Cruz is widely expected to run in 2020 should Trump lose to Hillary Clinton. His none-too-subtle message landed like a political hand grenade in a convention already marred by an opening day floor revolt from anti-Trump delegates and other missteps by the campaign. “Wow, Ted Cruz got booed off the stage, didn’t honour the pledge!” Trump tweeted, referring to the pledge all 17 Republican candidates took to endorse the eventual nominee, whoever he or she would be. I saw his speech two hours early but let him speak anyway. No big deal! The political theatre stepped all over Indiana Governor Mike Pence’s moment in the Republican spotlight as he introduced himself to US voters as Trump’s running mate. Pence accepted the vice presidential nomination, saying he was “deeply humbled by your confidence”. The delegates rose collectively for a standing ovation. Pence, 57, said he “joined this campaign in a heartbeat” because Republicans nominated Trump, a man “who never quits, who never backs down”. The conservative evangelical Christian and former congressman could serve to steady Trump’s heaving and swaying campaign ship and reassure voters alarmed by Trump’s rhetoric. But his task may have been made harder by Cruz’s stunt. “We were really waiting for him to show unity and really get behind the candidate, which he failed to do,” said the 49-year-old Michigan delegate. I think it was the longest boo I have ever heard publicly, it was really embarrassing. New Jersey Governor Chris Christie, a Trump friend and supporter, minced no words about Cruz, calling the senator’s speech “awful” and “selfish” on CNN. Trump’s lawyer Michael Cohen was harsher, saying Cruz “committed political suicide”. The upset came hours after Team Trump moved to draw a line under a damaging plagiarism row implicating his ex-model wife — that overshadowed the opening of the Cleveland gathering. A Trump staffer admitted to lifting quotes from a Michelle Obama speech from 2008 and slotting them into remarks delivered Monday by Trump’s Slovenia-born wife, apologising and offering to resign. “This was my mistake, and I feel terrible for the chaos I have caused,” said the staffer, Meredith McIver. Trump’s roller-coaster campaign defeated 16 rivals and steamrolled stubborn party opposition after being written off as a joke, the real estate tycoon having never held elected office. His campaign defied political norms — embracing racially inflammatory policies, offending key voting blocs, eschewing big-spending advertising campaigns and relying on saturated media coverage above campaign structure. With the Trump ticket now seeking to unite Republicans, unrest flared briefly just one block from the convention site. Eighteen people were arrested as protesters tried to set fire to American flags, police said. Two officers were “assaulted” and suffered minor injuries. The tumult in Cleveland — both on and off the convention floor — was a reminder of the scale of the task before Trump if he is to quiet questions about his campaign’s professionalism and heal crippling party divisions, let alone win a national election. Email “Cruz shocks Republican convention by refusing to endorse Trump”. Feedback on “Cruz shocks Republican convention by refusing to endorse Trump”.